My Favorite Eco-Friendly Yoga Mat. 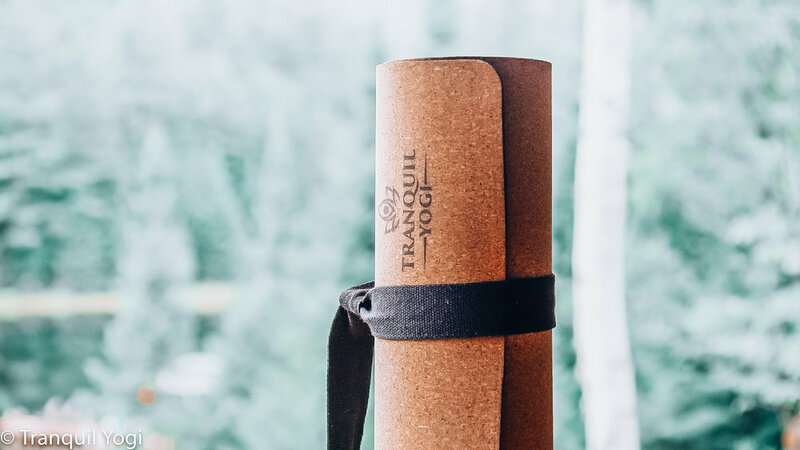 “Tranquil Yogi” Cork and Natural Rubber Yoga Mat. so my hands and feet effortlessly stay grounded - especially in poses like Downward Dog. Bonus: It gets even grippier when its sweaty! So it perfect for Hot Yoga or a vigorous Vinyasa class! so I don’t have to put a blanket under my knees every time I’m in a Table Top or Low Lunge position! This bad boy has a 5mm thickness made of natural rubber. So its perfect for a Yin or Restorative class when you know Childs pose is going to be held for many breaths! and disguises dirt marks (I like to take my mat outside in the summer and sometimes that means my soil covered feet leave marks all over my mat). The cork surface perfectly hides any residual stain and is a naturally anti-microbial material. Enjoy a low maintenance, germ free surface free of odor. Most importantly, cork and natural tree rubber are sustainable, renewable, biodegradable, and toxic-free materials! Did you know, most yoga mats are made with PVC which is toxic to humans and the environment and that mats made with it can take hundreds of thousands of years to decompose in a land fill? …and if that wasn’t enough to make me love this mat, it also comes with a carry strap (if you get it on Amazon) for easy transportation. So spread the word bird; with all the deep breathing and face planting (Crow pose anyone?) we do in yoga, it is important we aren’t nose deep in toxins. Save yourself, while saving the planet. You can find it online at amazon.ca (it is cheaper to buy it on Amazon if you want the mat & strap!) or tranquilyogi.com. Sign up with your email address to stay in the know about special events and other goodies!